Happy Friday the 13th! In true Friday fashion, I have a handful of outfits I wore last week to share with you. Let's hop right in! I found this top at a local boutique, and I loved it. It's very reminiscent of a kimono, except without the fuss of worrying about it falling off your shoulders. I also loved the tie detail at the hem! 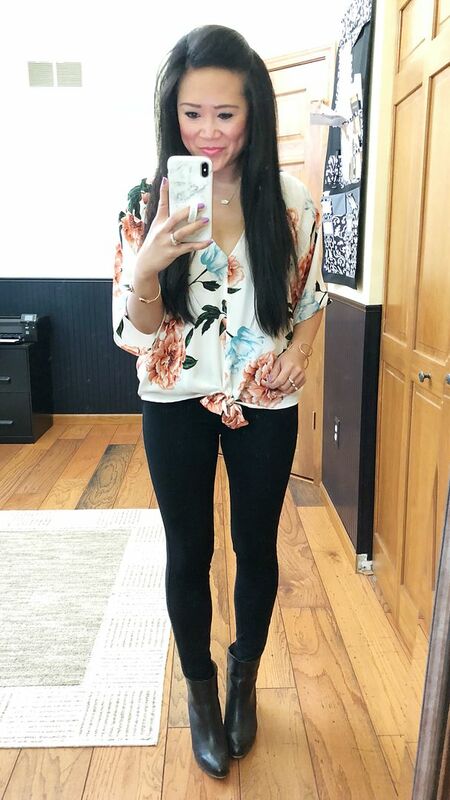 The print is so great for spring! If you're local to St. Louis, you need to pop into The Paperdolls Boutique to check out their stuff! All oldies but all goodies here. 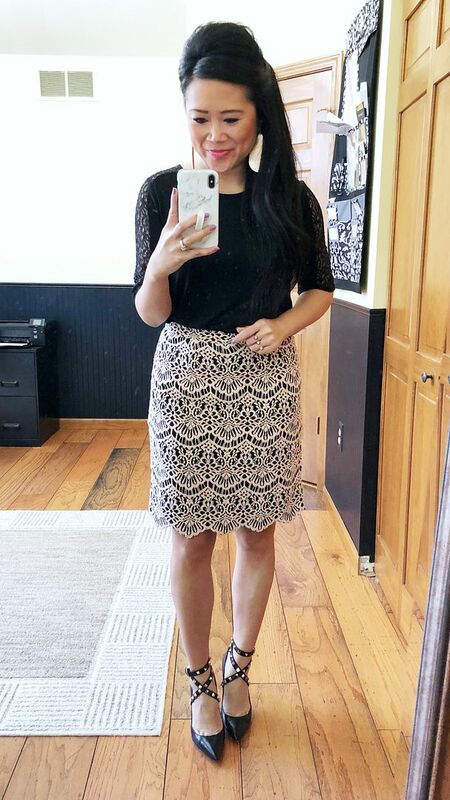 I have this skirt in two colors and I always reach for it when I need something easy to wear because I know it will always look good and make me feel good but it is just as effortless and soft as a tee shirt to wear. Knotting a tee is the easiest way to finish off this look. And I decided to stay with the linear theme I have going on here and paired it with my triple-strap pumps. Also oldies but goodies here. Admittedly, I need to build/re-build my skirt collection, so chances are, if I'm wearing a skirt, it's a pretty dang old skirt. But, this one is a keeper and it's one of my favorite anniversary sale purchases I have gotten to date! My tee has a lace detail on the sleeves, so I was going for lace on lace with a touch of edge like usual with these pumps. The combo makes me happy. And last but not least is my Easter outfit that I re-wore for work. I decided to go for these abstract floral pumps instead of the Rockstuds I wore for Easter. (If you missed the Easter look, you can get yourself caught up here.) I really do love this top, and I am SOTEMPTED to order it in a second color because it is that good. It is taking all my brute strength to not get a second color... I got so many compliments on this orange-red color, but I'm not surprised because it's really stunning! Seriously recommend. Short and sweet today. Hope you found a bit of inspiration here regardless! Have a great weekend and see you next week! This red top really is stunning on you, loving all these pretty outfits. Love all the outfits this week as well as the different hairstyles! That shade of red really does look gorgeous on you, and I can see why the lace skirt is your favorite Nsale purchase. It's beautiful!